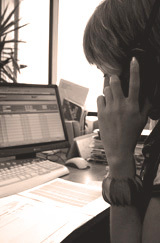 We can be reached by tele­phone Mon­day to Fri­day 8,00 a.m. — 7 p.m. You can e-mail us at any time. If request­ing a quo­ta­tion please use the enquiry form. You will usu­al­ly receive an esti­mate from us with­in 2 hours.